When the current flowing through the Fuse is fairly large or even short-circuited, the fuse is still required to safely disconnect the circuit without causing any damage. Breaking capacity is the most important safety index of fuse. It represents the maximum current that can be safely cut off under the specified voltage. Breaking capacity is also known as maximum breaking capacity, short circuit breaking capacity or maximum breaking current. The breaking capacity of the fuse depends on the structure of the fuse and the material used. In general, most low-breaking fuses are glass-enclosed; high-breaking fuses usually have ceramic enclosures, many of which are filled with pure granular quartz materials. When the overload current does not exceed the maximum breaking current, the fuse can not break, explode, splash, and cause the surrounding people and other components to burn coal, damage and other unsafe phenomena. The rated breaking capacity (in the UL file) is directly related to the rated current and the load voltage of the fuse. The larger the rated current, the greater the breaking capacity; the higher the load voltage, the lower the breaking capacity. UL 198-G Specification Breaking Capacity: Under AC 125V conditions, the fuse must be able to cut the current of 10000A, under AC 250V conditions, the fuse must be able to cut the current as shown in the table below. The voltage drop of the small fuse has a great influence on the low voltage circuit. Be careful! In extreme cases, it will make the circuit unable to output working electricity. 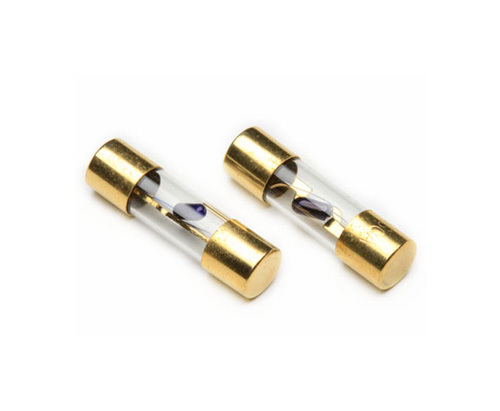 Looking for ideal Glass Tube Fuse AGU FUSE Manufacturer & supplier ? We have a wide selection at great prices to help you get creative. All the Electronic Components Glass are quality guaranteed. We are China Origin Factory of Auto Glass Tube Fuses. If you have any question, please feel free to contact us.